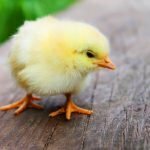 How to keep your sanity while starting a homestead. 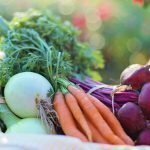 Learn how to start your homestead right! 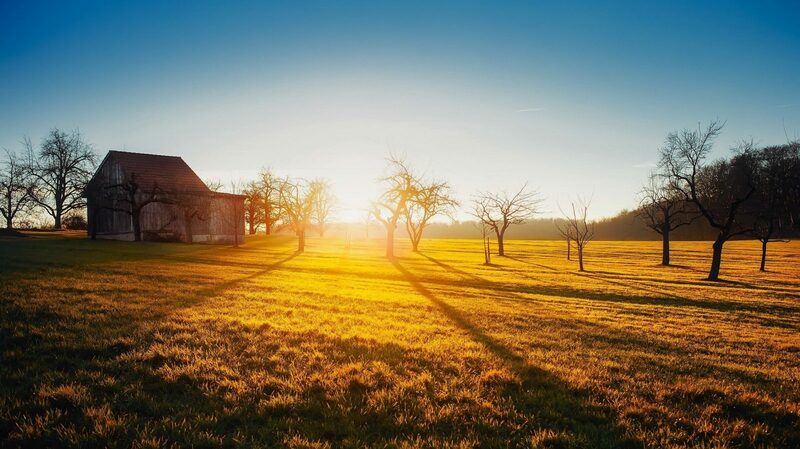 Starting a homestead can be a daunting task. You may feel overwhelmed, and rightly so! There is always so much work to do on the homestead. And if you and your family works outside of the home, that just adds another layer of difficulty. 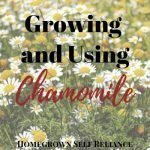 Here are my top tips to starting your homestead off right, and not losing your sanity in the meantime. The hubby and I have wanted our own homestead for years. He grew up on a farm. I didn’t, but I have always felt drawn to the “simple” country life. Unfortunately, land is expensive! So, needless to say, we haven’t been able to buy our own property just yet. In August, an opportunity presented itself. We had to move out of our rented home in a subdivision (through no fault of our own), so we went looking for a little more land. I love gardening, so we decided we should rent a place where we could do that and more. We found a little house on 3.8 acres in the next town over. It was surprisingly only $100/month more in rent than our suburban house. The home was built in 1915, but had been renovated. All original wood floors, a nice wood stove, huge pantry, plus modern touches like a dishwasher. It is a small house, considering we had 7 people in our family at the time (we have since added to that number!). But we decided we wanted to make it work. We signed a year lease and didn’t look back. Here are a few tips on starting a homestead that we have learned along the way. Always consider the fencing. When we first moved in, we didn’t consider the fencing. The pasture fence was 102 years old, and not that stable. We figured we’d just fix it as needed. Fencing is very expensive. Trust me on this one, you need to think about fencing BEFORE it’s needed when starting a homestead. Of course right away we started dreaming of how to grow our little farm. The hubs was scouring Craigslist trying to find the perfect animals to add. His family always had cows when he was growing up, so this was the first thing he wanted to start with. We discussed the economics of what breed of calves to get, and after some researching (and sticker shock from looking at the prices of some of the calves! ), we decided we would start with Jerseys. There are a lot of dairy farms in our area, so Holsteins and Jerseys reign, and we were able to get our Jerseys for $20 a calf. 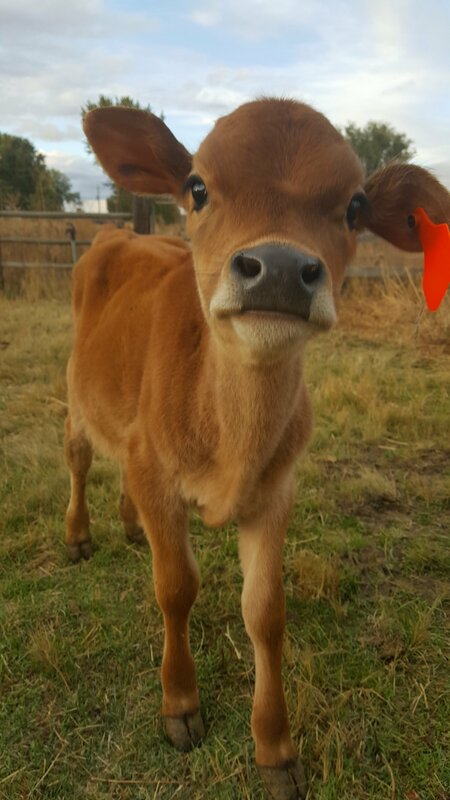 A few days after we decided we would get a few Jersey calves, the hubs texted me while I was at work. “Come outside, I have something for you”. I went out and there in his truck was 4 tiny calves. In the bed of his truck. With my son and my daughter holding them so they didn’t jump out. Keep in mind, at this point we hadn’t worked on the fence yet. We had no calf pen. We had a little 3-sided shelter in the corner of the property, but with no fencing around it. So after we got the calves home, we had to scramble to get a pen set up. Not exactly the proper order, but sometimes we are hard learners! Luckily we had several extra large pallets, so we immediately set to work arranging the pallets into a pen. The first one was pretty small, so we actually had to add to and re-arrange the pallets a few times. I think we changed the pen 3 times in just as many weeks. About 2 months after we started with the calves, the hubs bought me the Nigerian Dwarf goat that I’ve wanted for years. And we didn’t have a pen for her! And then, of course, ONE goat is a lonely goat, so we had to get another. I found a great deal on a nice Nubian doe that was in milk, so we snatched her up too. We kept them in our little barn for a couple days until we all had a full day to work on fencing. We ran 3 strands of barbed wire on about 1/3 of the pasture to keep the calves in, since we were limited on time and resources to secure the whole pasture. The calves went out to the sectioned-off pasture and the goats went in the pallet pen. Now the goats were nice and secure, but the calves kept escaping their pasture. We needed hot wire. We bought a used hot wire box from someone off Craigslist for $25, but it didn’t work all the time. So we had to buy a new one. That was another $115.Then the wire itself was another expense. Finally I can say that the fencing is secure, on that under 1 acre. But now, the calves are getting pretty big and are over-grazing their section of the pasture. It’s spring and we are still going through nearly a bale of hay every day. So the next step is going to have to be, to check and repair the full pasture. More cost, more time. Moral of the story here is, get your fencing set up FIRST when you are starting a homestead! Consider the irrigation. On this farm, we have flood irrigation. We have a ditch that snakes around the property, with barricades every so often to block off that section to flood. Unfortunately, it hasn’t been used for several years, so the barricades need a complete overhaul. I haven’t even looked into the cost of said project, but I’m sure it will be costly as well. We only have one working water spigot so using a sprinkler is pretty much out of the question, though. That will have to be used to water the grass and the garden. Here in Southwest Idaho, we have very hot, dry summers. Couple that with a handful of cows and goats that need to graze, and it spells disaster. The grass won’t be able to keep up with the demand without sufficient water. So we will have to bite the bullet and fix the irrigation system as well. My advice to you is to plan the irrigation well while you are starting your homestead. It will save you lots of headache down the road. Make a plan. Yes, I am going to preach baby steps here. 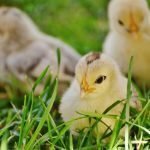 It is so easy to get overwhelmed with your new homestead adventure. Trust me, I know! 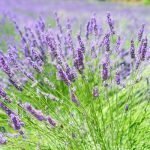 Between the day job, the homestead work, the normal household work, and starting this blog, I have felt some serious overwhelm! Baby calves need bottles, milking goats need milking, chickens need watering and feeding. Farm chores don’t stop or slow down when it’s cold outside, when you’re sick, or when you’ve just had a long day at work and want to relax on the couch. Make sure your farm plan doesn’t involve too many new projects at once. Try to tackle one new adventure at a time, and make your own personalized farm plan. Take in consideration the space you have, the food you eat, your budget, and the time you have. For us, we started with the cows, and when they were off the bottle, we added laying chickens. 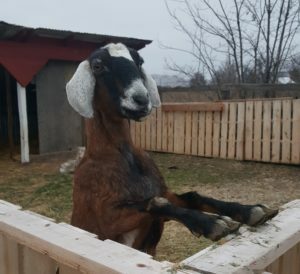 When I got the hang of the chickens (they are really easy, actually), we added the goats. After that our expansion stalled a little because it was winter. Now that spring is here we can push forward again. 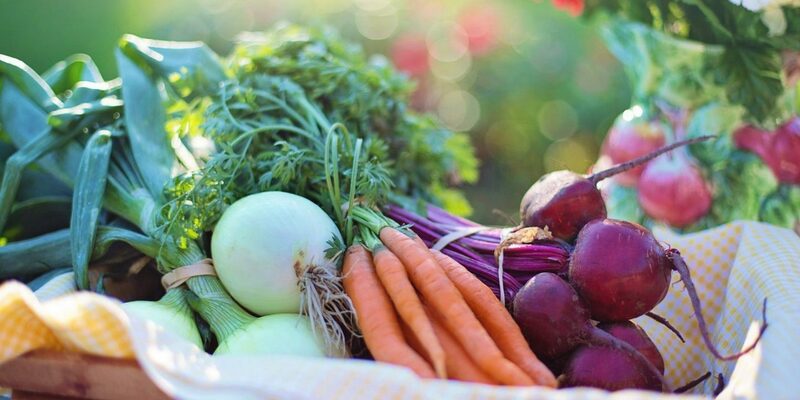 Our plan for this year is to grow at least half of our own food. We recently got 50 meat chickens and 4 turkeys. In less than 3 months we will have nearly enough chicken in the freezer to have a whole chicken once a week. And by Thanksgiving, we will have a nice fat, healthy turkey to grace our table, plus a few more to have whenever it strikes our fancy. The next step in our homestead plan is to add 2 pigs and meat rabbits. Again, we don’t have pens for them yet. Hopefully we’ll actually prepare BEFORE we expand this time. Set reasonable expectations. Again, this is key to (try!) avoid overwhelm. 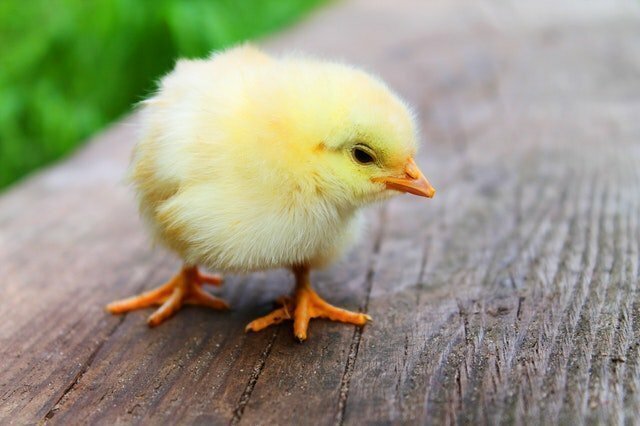 If you have never raised farm animals before, please please please consider raising “easy” animals first. We started with calves. Cows are not an “easy” animal. Although the hubs has tons of experience with cows, I do not. I mistakenly thought that cows would be so easy, just put them out to the pasture and they take care of themselves. I thought that would be the least amount of effort for gaining lots of delicious, farm-fresh meat. Boy, I thought wrong! Since we bought day-old calves, they needed bottles at least twice a day. That meant bottle-feeding the calves before and after work. In addition to our 4, my niece bought 3 calves for us to put in the pasture with ours. So at one point, we were bottle feeding 7 calves. Which was ok since we had lots of helpers, but then they started getting sick. We had several calves that got really bad scours, and possibly even pneumonia. I had to learn how to give calves shots of antibiotic, had to learn the struggle of feeding a calf that just doesn’t have the energy to eat, and even had to learn how to tube feed a calf. Our daughter was even designated as the “animal medic” to study up on symptoms and treatments. Apparently we didn’t learn about electrolytes quickly enough, and we ended up losing several calves. Heartbreaking, yes, but since they were only $20 a calf it wasn’t such a huge blow. 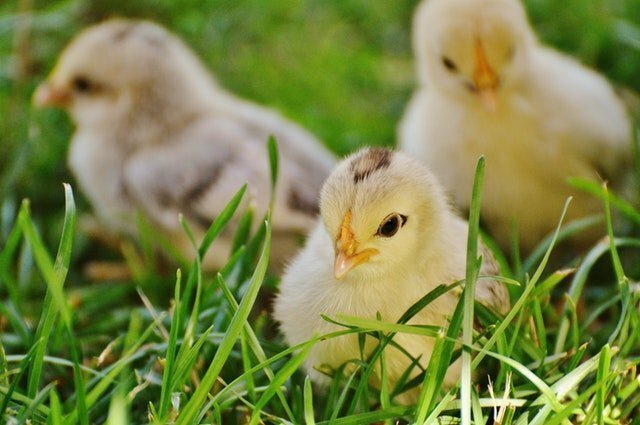 If I were to do it all over again, I would tell myself – Start with chickens! So that’s what I’m going to suggest to you. I think the best stepping stones for farm animals would be: chickens, rabbits, goats, pigs, then cows, in that order. Of course there are many other animals that may fit amongst those steps, but I have zero experience with them so I’m not going to include those here. Don’t try to rush it, no matter how badly you want all the things! Take one step at a time, based on your experience and confidence levels. 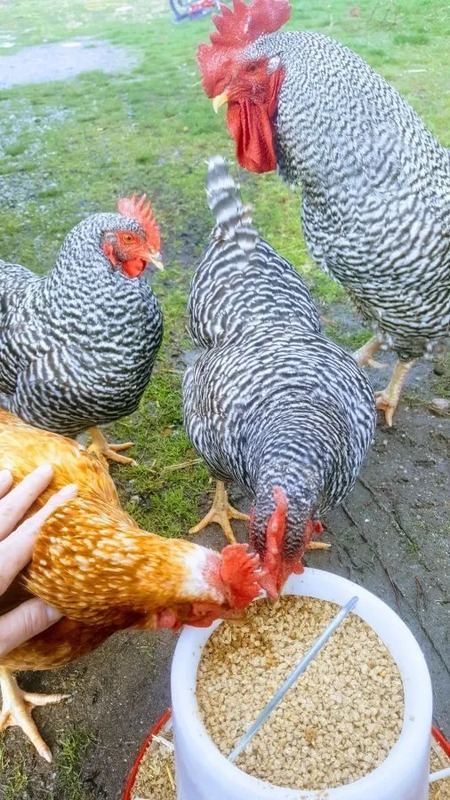 Get some chickens, learn all you can about them, enjoy their antics and eggs, then move on to the next project. The same goes for gardening. You don’t want to bite off more than you can chew! 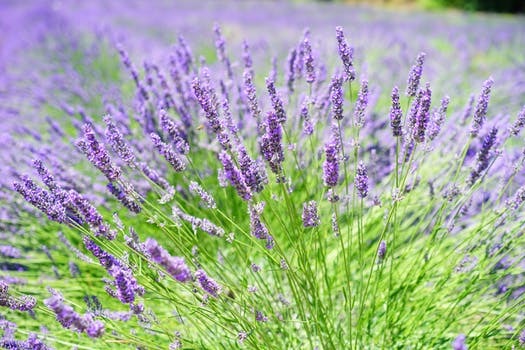 If you have never gardened before, don’t unrealistically think that you’ll be able to grow a beautiful, huge garden. Start off slow, gather information from either the internet or an old farmer, and realize that some crops won’t be successful. It depends on your experience, your knowledge, and your climate. Baby steps here too, folks! Don’t sweat the small stuff. Life on the farm is so much different than life in suburbia. Trust me on this one, you will NOT have the time that you used to have. So sometimes, something’s gotta give. It may be that your house isn’t as clean as it was when you lived in town. Or your car might not get as much pampering. You might not even have the time (or desire) to get a manicure. I say, don’t sweat the small stuff! If it’s really important, you will find the time to do it. If it’s not as important, then it’s just not as important! Priorities change. With us, we have found that living a “simpler” life is so much less stressful, even with more work to do. With a plan and proper management, starting a homestead without losing your sanity is possible. 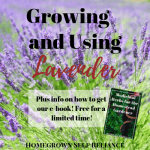 Take a deep breath, pull out the handy dandy notebook, and get ready to plan your way to self reliance on the homestead! 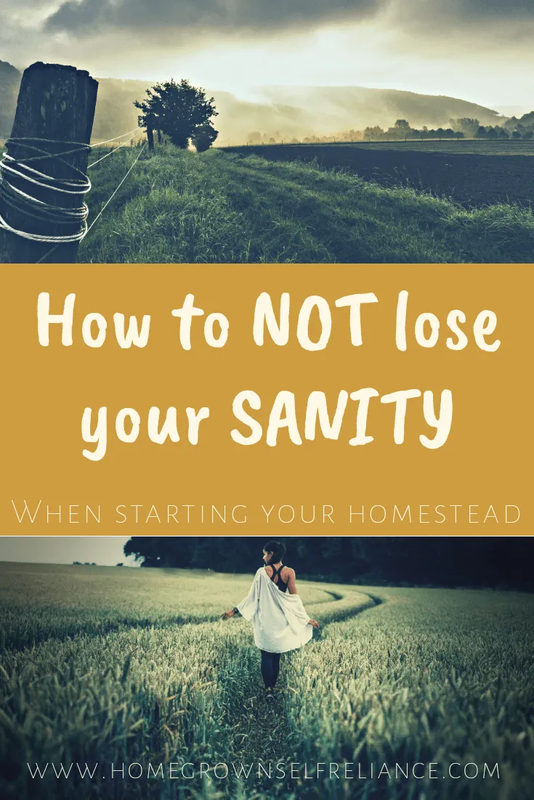 Do you have more tips for keeping your sanity while starting a homestead? Please share in the comments!